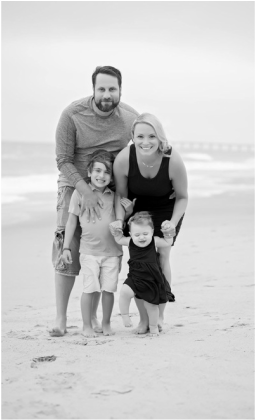 Adam and Melissa Yoskowitz are the co-creators of The Hudson Shea Foundation established in memory of their firstborn son Hudson who passed away unexpectedly on May 26, 2011. In the last five years since their loss, Adam and Melissa's journey led them on a path of healing and renewal. They have since been blessed with two beautiful children. Their rainbow baby, Cameron Skye Yoskowitz, was welcomed into the world at 33 weeks on December 20, 2012. After spending a month in the NICU recovering from surgery to correct a rare birth defect, Duodenal Atresia, (diagnosed during Melissa's pregnancy at 20 weeks) this little champion is now a healthy and thriving three and a half year old with a smile as big as his heart. His sweet and sassy little sister, Emerson Rose Yoskowitz, followed on March 20, 2015 and has since brought tremendous joy and peace into their home. Cam and Emmy join Adam and Melissa's two fur babies Dakota and Montana into a very full, very loud and very loving household. From the darkest of places the light has finally broken through. While they continue to grieve Hudson every day, their house is now filled with the sound of children's laughter echoing on the walls (and barks) proving that where there is life, there is always hope. On June 15, 2010 Stella Faith Himmelbaum made her grand entry into the world weighing 1lb, 3oz. Born prematurely at 22 weeks, Stella fought bravely for twenty six hours. After her passing, Canaan and Sarah spent months grieving Stella's loss and trying to make sense of the incomprehensible. While they were grateful for the loving support of close family and friends, Canaan and Sarah struggled to move forward. Less than a year after their loss, Canaan and Sarah were beyond blessed to welcome a son, Aiden Joseph Himmelbaum on June 1, 2011 to help heal their broken hearts. Aiden spent three weeks in the NICU at Lenox Hill Hospital. It was there that Canaan would meet NICU nurse Tara Kwilecki, who would connect him to Adam Yoskowitz, who had just experienced his loss weeks earlier. Canaan and Adam would go on to forge an instant bond by this shared tragedy. Their brotherhood would lead them to the conception of a mens support group for fellow struggling bereaved fathers. Canaan and Sarah's house is now filled with the pitter patter of Aiden and his little sister Zoe Faith's footsteps who joined her big brother on August 26, 2015.